United Yacht Sales New Jersey would love to guide you through a personal showing of this 150' Palmer Johnson Pj150 2007. This yacht for sale is located in Unknown, Florida and priced at $12,645,000. For a showing please contact us by filling out the form on this page and we will get back to you shortly! Grey Matters is the best in class. 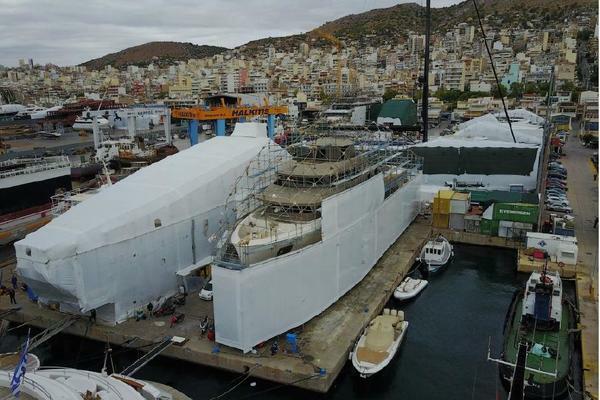 No other 150' PJ or similar yacht has had the upgrades, improvements or care that Grey Matters has had. Grey Matters is the only yacht of this style in the world with zero speed fin stabilizers and zero speed gyro stabilizers. If you would prefer the amazing adventures and vacations possible on Grey Matters rather than spending months and months in the shipyard that will be necessary to bring the other similar yachts to the condition of Grey Matters then look no further. If nothing else your wife will be very happy with the advanced stabilization systems that were recently installed. The seating area on the main deck aft of the salon is inviting and comfortable. Whether you are starting your day with coffee or discussing the day's activities with family and friends, you will find yourself relaxed and able to enjoy the scenery. Moving a bit forward on the main deck is the open dining salon area. After a few great meals here you will never want to eat indoors again. The large, all-weather flat screen TVs on either side of the dining salon offer music, videos, or the ability to keep up with the current events. A little further forward and through very large sliding glass doors is the elegant salon and formal dining salon. The large windows offer amazing views and open the salons up to be bright and welcoming. There is a large bar to the starboard side with chairs that offer a great area for more formal entertaining. Forward of the salon area is the media/study room. This space has an enormous TV for watching movies. It closes off to offer a great space for small children to play. It also can be used for private conversations or simply to take a nap. Forward of the media room is the large commercial galley. The galley is not lacking for any appliance, refrigeration, or freezer space. The lower deck area is where you will find the master suite and four guest suites. Keeping the bedrooms low in the yacht offer greater comfort while underway and keep the rooms quiet during busy times on board for those who choose to sleep in. The upper deck is the space that you have always dreamed of having on a yacht. The large seating area midship is the focal point for casual entertaining, family fun and total relaxation. A bit aft of the seating area is a large comfortable bar overlooking the hot tub. It is not hard to imagine yourself seated at the bar smoking a cigar and watching the scenery pass by. The hot tub is just aft of the bar. Aft of the hot tub is a massive sunning area with large sun loungers. Grey Matters has had several recent refits to meet the demands of the past two owners. Both were very experienced and knowledgeable yacht owners. Both have done refits in the past and created a work of art with Grey Matters. You can avoid the turmoil, expenses and aggravation of an extended yard period that will be necessary to bring the comparable yachts to the condition of Grey Matters. Along with the comfort and elegance that is obvious in Grey Matters she also meets the highest standards of safety with the flag state commercial certificates and Lloyds Class.